Ever since developer Ian Schrager opened Morgans hotel in Manhattan in 1984, boutique lodging has been a hip alternative to large resorts and hotel chains. The globetrotting millennial population will further spur the trend, suggests Skift, a website tracking travel industry trends, as they prefer chic environs with personal amenities like wine tastings, on-site spas, hi-tech work spaces and high thread-count bedding. In Laguna Beach, small hotels are being revitalized to not only appeal to guests with an aversion for chains, but to capitalize on their historic value. The Coast Inn and Casa Laguna Inn & Spa, both close to the century mark, are modernizing, and a different kind of change is afoot at a former midscale chain hotel with an enviable location. All three properties were purchased in recent years at prices reflecting the demand for coastal resorts, but still far lower than larger upscale properties like the Montage, which sold last year at a record $1.4 million per room, comparable to the Waldorf Astoria in New York City. “Laguna hotels trade for a higher price per room than other Orange County hotels due to location and the huge barriers to entry,” said Alan Reay, president of Atlas Hospitality Group in Irvine. The dated oceanfront Coast Inn changed ownership in 2013 for $11 million or $458,000 per room, Casa Laguna Inn & Spa was acquired in 2014 at $7.3 million or $356,000 per room, and Travelodge changed hands in 2015 for $5.3 million or $123,000 per room, according to Reay. 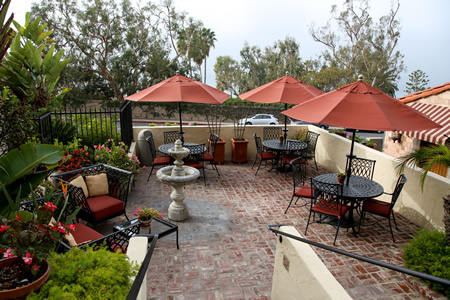 Chef Sarah Keenan can now welcome the public to Casa Laguna Inn’s tiny outdoor dining room, if reservations permit. Photo by Jody Tiongco. Casa Laguna Inn, rated second in the city only to the Montage by TripAdvisor guests, received City Council approval last week for a conditional use permit to incorporate a reservation-only restaurant on the premises open to the public. The permit enables the hotel to sell alcohol, as well as reconfigure four rooms into three. The remodel will bring the room total to 23, without expanding square footage. Casa Laguna was built in 1928 as a private residence and served for over 20 years as the staff quarters for the celebrated Villa Rockledge across Coast Highway. A motel was added in 1946 and the property turned into an adults-only bed and breakfast in 2000. Britten Shuford, president and managing partner of the new proprietor, PRG Investment and Management, a real estate investor in Santa Monica, said the priority is the redesign of the guest rooms and lobby with the goal of honoring the Spanish Mission style. “PRG specializes in boutique hotels with an emphasis on older properties with unique character and historic relevance,” Shuford said. PRG’s holdings include hotels in San Luis Obispo and Indian Wells. This is their first in Orange County. Under the previous liquor license, Casa Laguna was permitted to serve alcohol only as a complementary pour, with the cost factored into the room rate. The new permit authorizes the sale of alcohol once the restaurant is open to the public, both providing an additional revenue stream. General Manager Sylvia Echuryan said there are no plans yet to expand beyond breakfast and, because of limited seating, guests at the inn will have priority for reservations. The Coast Inn opened in 1923, but its last call as the hub of gay nightlife came in 2007, and challenges to previous redevelopment proposals kept the project in limbo for five years. Now owned by Dornin Investment Group of Laguna Beach, current plans reflect a desire to return the property to its former glory. “Troops during World War II came to this hotel from Camp Pendleton and Long Beach, and by mid-century, the Boom Boom Room was the gathering spot for the gay community,” said Marshall Ininns of Marshall Ininns Design Group in Laguna Beach, who is spearheading the restoration with Doug Walton at DWA, a commercial design firm in Las Vegas. Architectural drawings feature 24 rooms and replicate the Spanish colonial revival style, according to Ininns, who used a 1932 postcard as a model and who counted grids in the windows for the sake of authenticity. Even recently closed Coast Liquor across the street, part of the property, has historic significance. “Built in 1955, this is one of the mid-century modern buildings by prolific architect Chris Abel,” Ininns said. Project manager Marcella Dornin said the team is excited to bring this historic establishment back to Laguna Beach, and plans to incorporate original names for the public spaces – Tap House, 7 Seasons and The Boom. A small pool and spa, and parking, will be added behind the store, which will be upgraded to a deli also serving coffees, smoothies and picnic baskets, Dornin said. Plans were approved by the Coastal Commission in August 2010 and recently received unanimous thumbs up from the city’s Heritage Committee. Planning Commission approval is still required, and barring any unforeseen hurdles, construction may begin later this year. Rounding out a trio of small hotels competing for the coastal traveler is Laguna Beach Lodge, acquired in September by local entrepreneur Chris Keller, a principal of Casa Resorts Group headquartered in Irvine. The 43-room facility, former Travelodge and Best Western affiliates, bills itself as the best value in town and cites proximity to post-card perfect Treasure Island Beach, fronting the Montage resort, as the unique feature. The lodge was the last local holding of the Ohana Group, which in recent years divested the Montage and Aliso Creek Inn. Keller said there are no development plans at present, but as the driver behind La Casa del Camino boutique hotel and rooftop bar, and owner of the fabled Marine Room Tavern, we might expect something of interest before long. It is great to see the Coast Inn being resurrected and used once again. I thoroughly enjoy the new owners vision of what it could and will be. Both the liquor store and the hotel complex is a big part of Laguna history. I want to point out a few corrections about the history of the Coast Inn. My Grandfather Pappy Smith opened the Coast Inn in 1929 not 1923 as stated in your article. Also I believe the 7 Seasons you mention was actually the South Seas which later became The Boom in the 70’s.